It’s looking even less likely that there will be a fourth season of the Hannibal series. NBC cancelled the show last month and the third and final season is currently airing on Thursday nights. Last week, we reported that, though the contracts for series stars Hugh Dancy and Mads Mikkelsen had expired, Gaumont International Television was still trying to find a new outlet for the series. Netflix didn’t seem like a real option because there’s already a streaming deal in place with Amazon which precludes other streamers. Fuller has also said that, because NBC has passed on season four, some international partners will likely not be interested. What do you think? 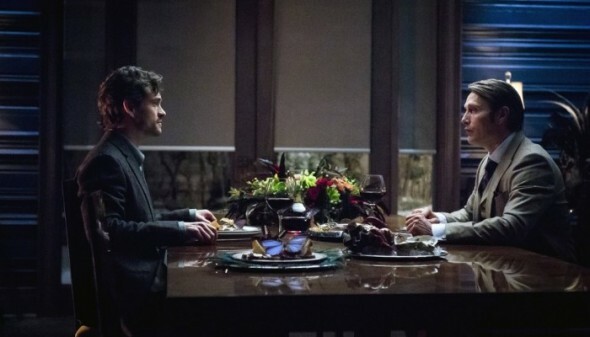 Do you think that there’s still a chance that Hannibal will be saved or, do you think the series is truly over? Here’s another reason to not watch NBC. There are so many terrible shows that get renewed year after year, networks keep wasting money on terrible pilots and one season runs, yet a well acted, visually stunning show with actual depth like Hannibal gets cancelled. It was the only show I watched on a regular network, and there’s a reason why. Nothing good is ever really offered. I stopped watching anyway. Couldn’t figure out what the heck was going on. It is becoming more and more apparent that networks do not care about the viewers. This is an awesome show. Sick and twisted but very well done. It is just a bad place to be as a viewer when the networks do not renew a show that has so much potential and they disregard us. Many of the shows they keep are terrible. Sad. I’ve never seen ‘Hannibal’, but I read your comment about the networks not caring about the viewers. I couldn’t agree more. ABC cancelled an excellent show called ‘Forever’ because they stupidly put it in one of their most difficult time slots, and then couldn’t be bothered to reschedule the show in a better time slot after investing in an entire season; why do that when they could deep six it – makes sense, right? (NOT). So another fantastic, family-friendly show bites it because of blind “visionaries” at the networks who can’t see past their wallets. Dexter was as vividly twisted and it had a following, thus Hannibal should never have been on a major network in prime time.